When the IBPS PO Main Exam is over and we will have the final review of the IBPS PO Main Exam. These exam reviews can be helpful in preparing for the forthcoming exams and also to know the weaker section of the candidates. So this will sharpen the preparations of the candidates in a great way. 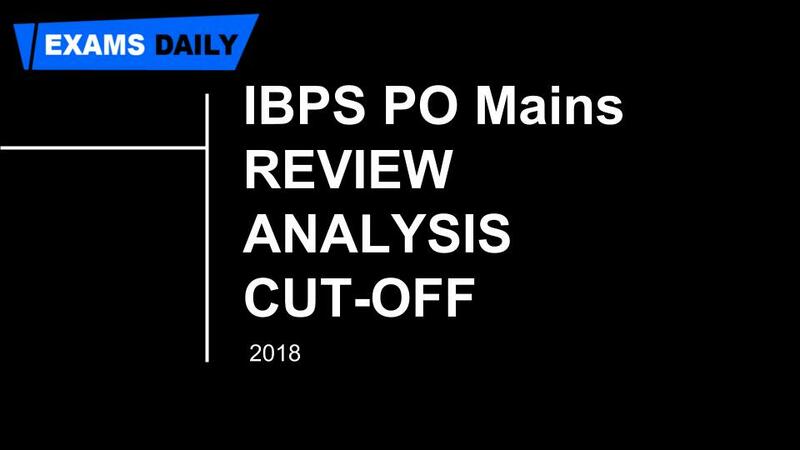 These are which the Topics were asked in the IBPS PO Main Exam is based on the below given order. Read more to know the topic asked in each sections. This section had 40 questions for 40 marks with a time limit of 45 minutes. This section was also of a Moderate level, the maximum number of questions were from Current Affairs. This section had 35 questions for 40 marks with a time limit of 40 minutes. This section was also of a Difficult level, the maximum number of questions were from Reading Comprehension. This section had 45 questions for 60 marks with a time limit of 60 minutes. This section was also of a Difficult level, the maximum number of questions were from Sitting Arrangement and Puzzles. This section had 35 questions for 60 marks with a time limit of 45 minutes. This section was also of a Moderate level, the maximum number of questions were from Data Interpretation. Candidates are requested to visit the page regularly in order to know the IBPS PO Exam Latest Updates from our website. If you know more questions that has been asked during this exam, share in the comment sections!